TRS-80 Model 100 (Computer); Programming. Amazon.com description: Product Description: Released in 1983, the TRS-80 Model 100 was an early portable computer. It was one of the first notebook-style computers, featuring a keyboard and a liquid crystal display; it was also battery powered and was roughly the size and shape of notepad or large book. 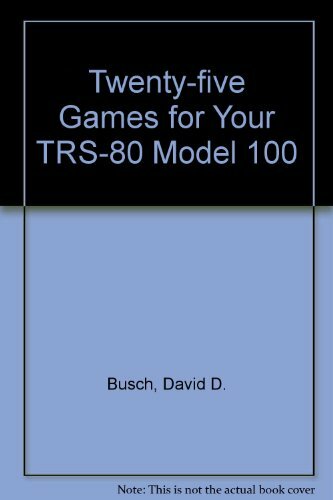 This book describes how to program 25 games into your TRS-80 Model 100 computer. You'll find a code cracker program, a road rally game, card games, a drawing program, craps, bowling, and an art auction. All twenty-five programs are clearly documented with remarks and text explanations, providing you with an easy-to-follow way to better your Microsoft BASIC skills while having fun! The complete list of games: Invisible Maze, Codebreaker, Avarice, Road Rally, Computer Magi, Swami, Worm Hole, Sketch, Swap, Bettor Draw, Duchy, Star Void, Paper Rock Scissors, Bingo, Candy Store, Craps, Phrase Guess, Stock Market, Skydiver, Bowling, Scramble, Slot Machine, Art Auction, Memory Stretcher, and Reflex. About: Released in 1983, the TRS-80 Model 100 was an early portable computer.